This entry was posted in bento box, black and white, borders by Norma Hanson. Bookmark the permalink. I’ve never seen that quilt done in B&W but I really like it! as they are doing a black and white plus one color challenge and this would be perfect. Awsome! You work really fast – puts me to shame. How’s the weather for you? I hear it is a possibility of snow again out your way. Have you had enough?? Regardless of how you do the borders, the quilt center is fantastic. 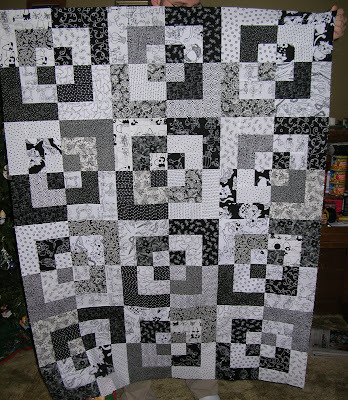 I think the black & white colorway works very well with that quilt pattern. Hmm – you think you want to add some color to it, so my question is – what are the colors of the room you think it might be used in? Would red go better or green or ? Very nice Mommy! I like how it’s all just black and white. I have those kitties – & their opposite. 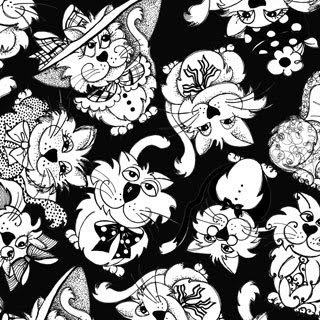 They did not make it into my black & white quilt – I couldn’t cut them!